Although the rocks at this site are commonly called onyx (on’-iks) or onyx marble, they are not true onyx. True onyx is parallel-banded chalcedony, a cryptocrystalline (microscopic crystals) variety of quartz. The Mt. Nebo deposit consists of reddish-orange and cream-colored banded calcite. Calcite is composed of calcium carbonate (CaCO3). Banded calcite is formed when calcium carbonate precipitates (separates out) from a solution of dissolved calcium carbonate and ground water. The calcium carbonate is deposited within a large opening or fissure in the mother rock and parallel bands are created as additional calcium carbonate precipitates. The changes in the color banding are probably caused by slight changes in the chemical composition of ground water during precipitation. The Mt. Nebo banded calcite can be polished and used for decorative purposes, such as bookends. 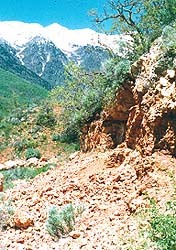 Travel about 5 miles east of Nephi on State Highway 132 to the Mt. Nebo Scenic Loop intersection. Turn north (left) onto the Mt. Nebo road and travel approximately 3 miles until you reach the turnoff to the Mt. Nebo Scenic Loop. Stop and park in the open space on the west (left) side of the main road. Walk about 0.2 miles up the Mt. Nebo Scenic Loop road until you see faint tracks on the northwest (left side of road). Follow the trail uphill about 0.5 miles to the collecting site, a red and white knoll west (left) of the trail. Go around to the other side of this knoll for the best collecting. 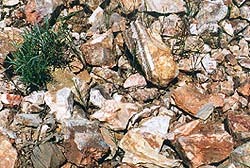 Numerous large and small rock samples litter the ground on the west side of the knoll. To obtain a sample from the outcrop you will need to remove it with a rock hammer or a hammer and chisel. Please remember to wear your safety glasses. Nephi 1:100,000-scale topographic map, Nebo Basin 7.5-minute topographic map, and a Utah highway map. Topographic maps can be obtained from the Natural Resources Map & Bookstore, 1594 North Temple, Salt Lake City, UT 84114-6100, (801) 537-3320 or 1-888-UTAH MAP. Beautiful wildflowers make spring a good season to visit this deposit. A hat, hiking shoes, and water are recommended. Bring a rock hammer and protective eyewear if you intend to break pieces of rock. Please carry out your trash. Have fun collecting!